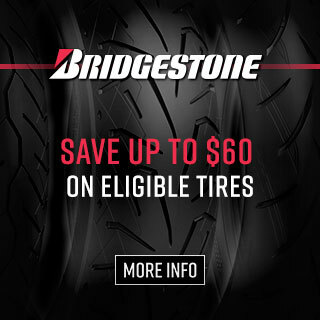 Bridgestone is offering a 2019 Motorcycle US Consumer Spring Promotion to receive up to $60 Reward. Tires must be purchased between March 1 - April 30, 2019. You must claim your reward by the 30th of May, 2019. When you purchase an eligible tire/s, you will recieve a payout in the form of a Brdigestone Visa Prepaid Card* in the mail. Claim submissions must be completed online here. Tier 1 Reward - $25 for 1 or $60 for set (2) of the models Battlax, Battlecruise, Exedra and Exedra Max tires. Tier 2 Reward - $15 for 1 or $40 for set (2) of ALL other Bridgestone Motorcycle tires. *Bridgestone Visa Prepaid Card issued by The Bancorp Bank pursuant to a license from Visa USA Inc. and may be used everywhere Visa debit cards are accepted. The Bancorp Bank; Member FDIC. The prepaid card is given to you as a reward or gift and no consideration, value or money has been paid by you for the card. No cash access or recurring payments. Card valid for up to six months, unused funds forfeit at midnight EST the last day of the month of the valid thru date. Card terms and conditions apply; see BridgestoneRewards.com/CardTerms. All trademarks and brand names belong to their respective owners. Purchases must be made from March 1, 2019 to April 30, 2019, and claims must be submitted online by the 30th of May, 2019. 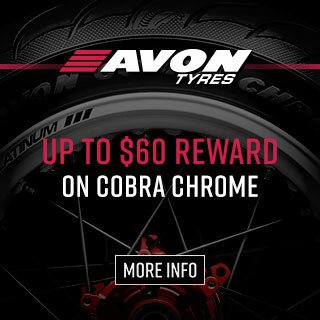 Avon Tyres is offering up to $60 *reward for their Cobra Chrome tires. Receive $20 reward for 1 tire, and $60 reward for 2 tires. The promotion runs from the 1st of March, 2019 until the 30th of April, 2019. Purchases must be made during the months of March or April, 2019. You must claim your reward by the 30th of May, 2019 by completing the purchase information online here. If you prefer to download, print, and mail the rebate, access the form here. *Disclaimer: The reward is in the form of an Avon Motorcycle Tyre Visa® Prepaid Card. In Canada, Visa prepaid card is issued by Peoples Trust Company pursuant to a license by Visa, Int. VISA® is a registered trademark owned by Visa International Services Association. In the U.S. card is issued by MetaBank®, Member FDIC, pursuant to a license from Visa U.S.A. Inc. No cash access or recurring payments. Can be used everywhere Visa (debit) cards are accepted. Card is valid for up to 6 months; unused funds will forfeit after the valid thru date. Card terms and conditions apply. Purchases must be made from March 1, 2019 to April 30, 2019, and claims must be submitted online or postmarked by May 30, 2019. 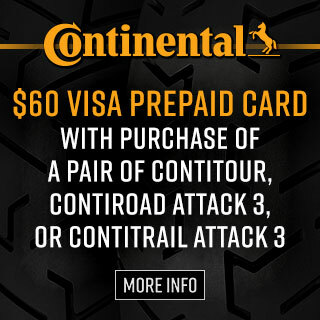 Continental Tire is offering a $60 *reward when you purchase a pair of ContiTour or a pair of ContiRoad Attack3 or ContiTrail Attack3 tires. The promotion runs from the 1st of April, 2019 until the 30th of June, 2019. Purchases must be made in the forty-eight (48) contiguous U.S. states and D.C. during the months of April through June, 2019. You must claim your reward by the 31st of July, 2019 by completing the purchase information online here. If you prefer to download, print, and mail the rebate, access the ContiTour $60 rebate form here and access the ContiAttack3 $60 rebate form here. *Note: The reward is in the form of a Continental Tire Visa® Prepaid Card. The Visa prepaid card is issued by MetaBank® pursuant to a license from Visa U.S.A. Inc, No cash access or recurring payments. Can be used everywhere Visa debit cards are accepted. Card is valid for up to 12 months; unused funds will forfeit after the valid thru date. Card terms and conditions apply. Purchases must be made from April 1, 2019 to June 30, 2019, and claims must be submitted online or postmarked by July 31, 2019. 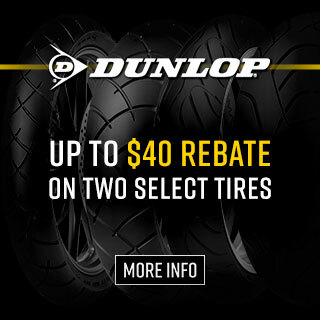 Dunlop is offering a $40* Rebate when you buy a set of eligible tires. Purchase must be made between March 1, 2019 and April 30, 2019. *Mail-In Rebate for a Dunlop Motorcycle Tires Visa® prepaid card for $40 is valid on qualifying purchases. The completed form must be submitted online or mailed/postmarked no later than May 31, 2019. Print form from here if mail-in is preferred. Rebate valid only with a copy of proof of purchase. Limit (2) per household and valid only for residents of the United States and/or Canada. Purchases must be made from March 1, 2019 to April 30, 2019, and claims must be submitted online or postmarked by May 31, 2019. Purchase an eligible wire set from the list below during the offer period and you will receive a free set of sparkplugs. Print and complete the Coupon from here and return it with a copy of the receipt showing the wire set purchased. Mail the Coupon and Receipt copy to the address on the form by May 15, 2019. 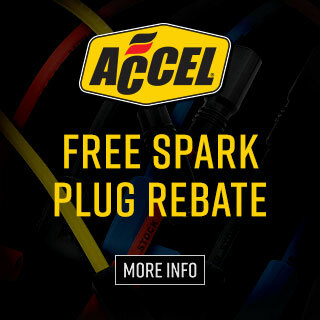 Accel rebate claims must be completed and postmarked no later than May 15, 2019.